Serving freshly roasted coffee, tea and confectionery, Coffee Plant is located in the heart of Notting Hill’s infamous Portobello Road. 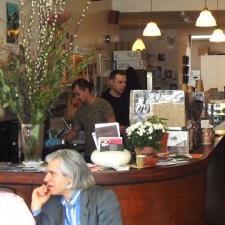 First opening in 1997, the cafe offers one of the largest ranges of organic and fairly traded coffee in the UK. Remaining popular with visitors and tourists to the market, the cafe remains abuzz with coffee drinkers over-spilling the street. I sat next to Alexa Chung here once; Albion is where the cool and the chic have coffee and croissant. Aussies do know a thing or two about good coffee and a hearty, healthy breakfast. It can be a tight squeeze but Cocorino offers a taste of Sicily in the middle of chic Marylebone.